It’s not very often that we see a rainbow in January, but on January 10, 2017, the weather was just right to make one appear in the sky. One very faint rainbow was seen from our front yard, which is unusual because we have always seen them looking behind our house, and a double rainbow from a school playground. I haven’t updated Rainbows in quite some time, but take a look at more rainbows that remind us of Kyleigh. We love to see babies showing off their Kyleigh’s Gift SleepSacks! Kyleigh’s Gift continues to give every newborn at Liberty Hospital Birthing Center a fleece Halo SleepSack to take home. The lightweight cotton SleepSacks are also available in the Liberty Hospital Gift Shop in a variety of sizes. More rainbows! On March 29, friends from Kansas City North and Liberty sent us pictures of a beautiful rainbow that could be seen about 30 miles away from our house. We continue to be touched when other people see a rainbow and think of Kyleigh. “She was my first thought! I pulled over to take this!” -Kathleen J.
Kyleigh consumes the month of April for our family, and that’s a good thing! Many wonderful things happened in April to remember and honor Kyleigh by. Donate Life Legacy Walk ~ April 1, 2017 – Midwest Transplant Network kicked off National Donate Life Month with the Donate Life Legacy Walk to honor donor heroes and celebrate life. It was a cold April morning, but we had a good time celebrating Kyleigh’s gift of life through heart valve donation! Kyleigh’s 5th Birthday ~ April 5, 2017 – We celebrated Kyleigh’s 5th Birthday with a family day at a local children’s museum, followed by lunch out. Kyleigh’s siblings enjoyed playing at the children’s museum and were happy to get a day off school. Her grandparents joined us and then other family members arrived later for dinner and cake. Releasing balloons at the cemetery is a special time that we share with our children as we celebrate their sister. Diaper Drive ~ April 5-19, 2017 – This was the third year that we celebrated Kyleigh by hosting a diaper drive to benefit HappyBottoms. Since it was Kyleigh’s 5th birthday, we decided to focus on collecting size 5 diapers. As always, our family, friends, community and strangers pulled through and sent diaper after diaper to our front door! Click here to read more about it, and to see the grand total! Kyleigh’s Gift 5 Year Celebration ~ April 20, 2017 – This was a big night for Kyleigh’s Gift! We celebrated five years of the Kyleigh’s Gift Fund~Liberty Hospital Foundation with family, friends and supporters. Kari Jo Thomann Bear, from Thomann Financial Services, Inc. and Liberty Hospital Foundation Trustee, presented the Kyleigh’s Gift Fund with $10,000 she received as an Asset Mark Community Inspiration award winner. With this gift, the fund has raised over $100,000 in five years! THANK YOU to Kari Jo and the Thomann family for your support! 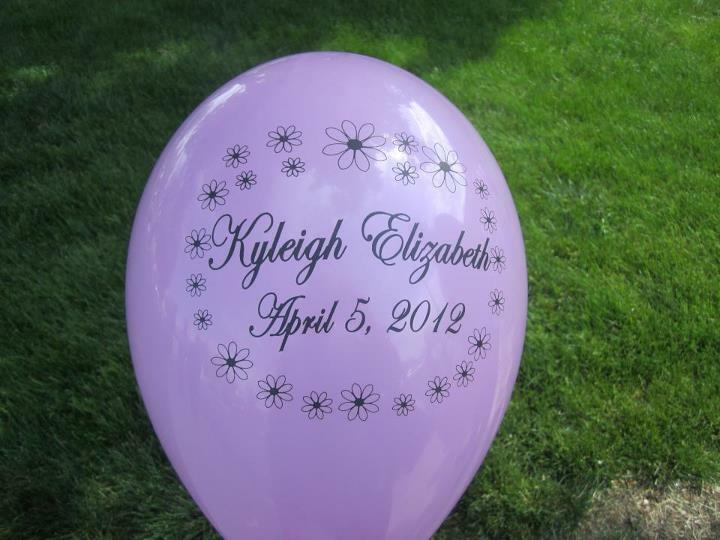 One piece that has been missing from Kyleigh’s Gift is support for bereaved families. We started providing support through Miscarriage Care Packages in November of 2016, but we knew that more needed to be done. We began hand-painting angels in May of 2017 for families that experience a loss at Liberty Hospital Birthing Center. The angels will be included in Memory Boxes along with photographs, hand and footprints, hand-knit hats and blankets, plus other keepsakes, provided by the Birthing Center. Our family spent Saturday in June celebrating Kyleigh’s gift of life through her donation of two heart valves. Thank you to Midwest Transplant Network for providing lunch and family friendly activities for Donor Family Day. It is always a beautiful way to remember all who have given the gift of life! July was a quiet month at Kyleigh’s Gift. We continued to support families in need, while beginning the initial steps in planning the upcoming 4th Annual Kyleigh’s Gift Run/Walk. July is usually the calm before the storm! September 16, 2017 … Six years ago today, our family moved from our home of 10 years to a new home located back in the town where we met and were married. I was almost 12 weeks pregnant with Kyleigh. She was with us six years ago and she showed herself today in the rainbow we saw while eating dinner to celebrate our home. The big news for the month of October is always the Kyleigh’s Gift Run/Walk! This marked the 4th year of having a 5K Run/3K Walk, along with a candlelight service for National Pregnancy and Infant Loss Remembrance Day. The evening turned stormy and cut our activities short, but it turned out to be one of our most successful years yet with just over 300 registrants and raising $21,500! Thank you to everyone who supported the Run/Walk this year!! In the days leading up to Giving Tuesday, we launched a 12 Days of Giving campaign on Facebook to highlight all of the things that Kyleigh’s Gift is doing within Liberty Hospital and the community. Take a look here, Kyleigh’s Gift Fund, or follow the Kyleigh’s Gift Facebook Page to learn more.